It has been a marvelous 4 days with me hitting three Holiday Open Houses that I adore. On Wednesday, I attended the Vintage Village Candlelight Open House, on Thursday, I was a the Buford Queen of Hearts Open House and then on Saturday, I visited Monroe, GA and three huge antique malls. I have lots of photos to share, but today's post will contain photos for only one booth. Why only one, you ask. Well, when visiting Davis Street Antiques in Monroe, I ran into an antiquing friend I had not seen in nearly 10 years. I happened upon a booth called "Romantic Farmhouse" and as I walked through it I knew I was in a place most familiar. I returned once more before I left Davis Street Antiques and there I find a woman "fluffing" the booth, my friend, Cheryl Alexander. Cheryl is one of those talents who has an incredible visual eye for decorating. When you experience her booth you know you have walked into a special place. I want you to know her Romantic Farmhouse booth through the photos that I took. It was wondrous in it's elegant simplicity with all shades white. Tiny white lights, mica churches and houses, candlesticks of many styles draw you into her booth. 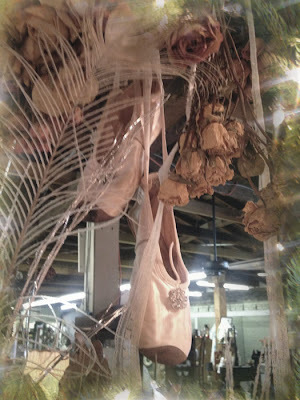 Pretty drieds hang from rafters, old windows repurposed into looking glasses and bottle brush trees abound creating tiny woodland spaces. 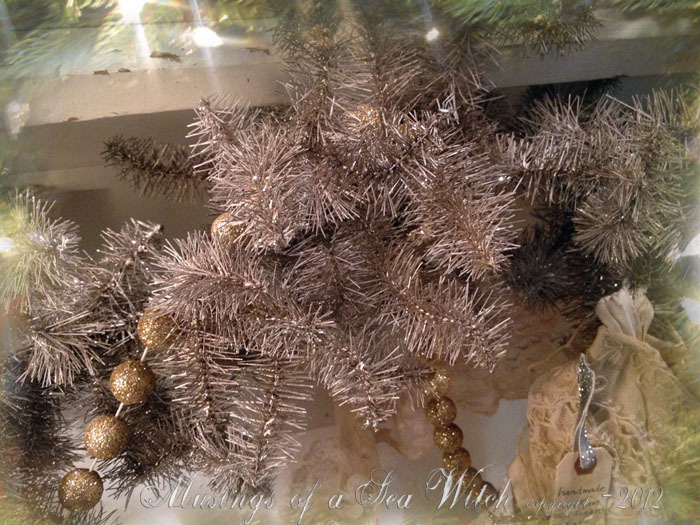 Soft white and glitter touched garland hangs from a shabby mantle. Entwined are pretty lace pieces, repurposed vintage items and garland. 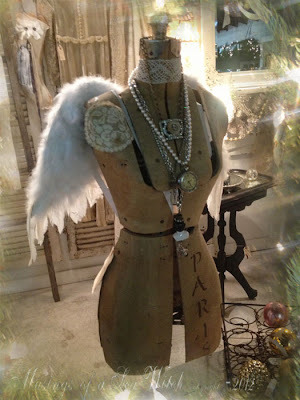 Vintage mannequin angels wear feathered white wings, jewelry creations and vintage lace. They say the devil is in the details and Cheryl has stenciled the word "Paris" on this heavenly body. When you look above she has transformed her empty ceiling space into a marvelous place. 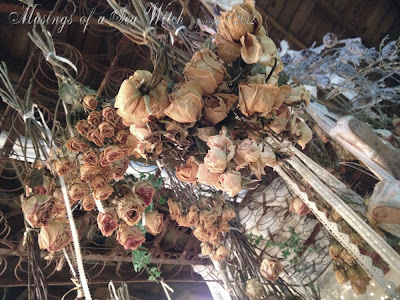 Old, rusted bedframes become an open display for hanging dried roses from old lovers and friends. 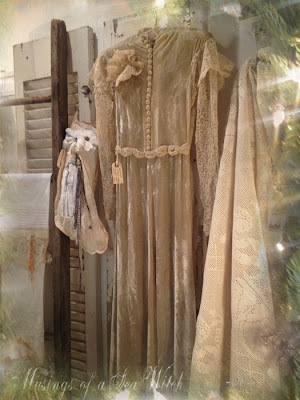 Dripping with vintage lace as well, this is one of my favorites areas of her booth. Nestled above the dried roses is a pair of toe shoes. I have a thing for worn ballet toe shoes. Never been a ballerina, but my middle sister was a gifted dancer. So much heart and physical passion goes into this art form, perhaps that is why I like them so. Those delightful bed frame pieces display delicate mercury glass ornaments...I am now on the hunt for rusted bed frames as I so love this decorating element. 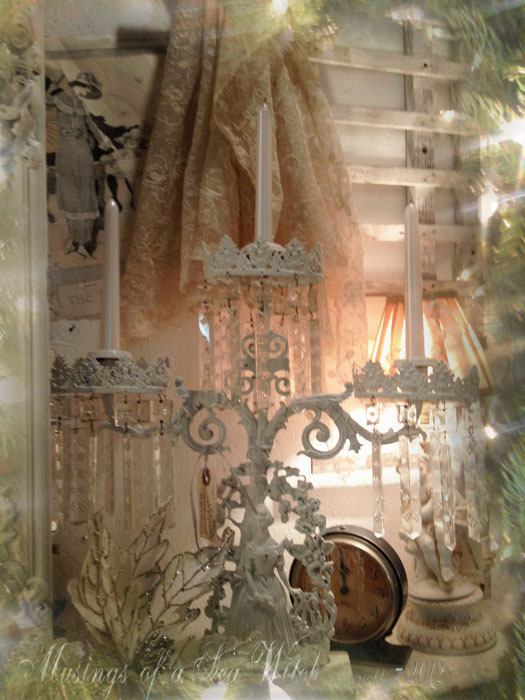 How lovely is this vintage candelabra with dripping crystals and delicate tapers. I would be burning candlelight each night if I had this in my home. Be still my heart...I have such a passion for vintage velvets and lace...I must go back and purchase this vintage wedding gown. 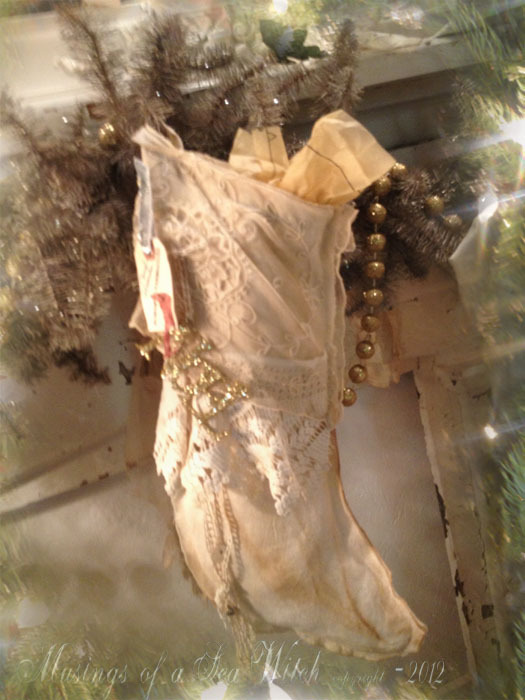 Antiqued and several shades of white, this stocking is scrumptious. What a marvelous place for tiny gifts to hide. Another lovely married piece created by Cheryl. You can see why I am always thrilled to discover the creative pieces that she envisions. Thinking I must have this piece too. Cheryl's booth is such a reflection of her heart and soul and gentle character. She bursts with a quiet creativity that translates true emotion to the pieces in her booth. As I took this final shot, I realized that Cheryl may have had the last laugh on me with this delightful angel she has on her entry post. A true self portrait if ever I saw one. Sweet face with sparkling blue eyes and that wild blond hair styled closely and just off the side of her head that begs the question, "Guess what I have been up to?" Arms clasped in front of her with a silver star, an angelic gift? Oh, yes, most definitely, because Cheryl's pieces are truly a gift from her heart. So good to see you my friend and now that I know where your hanging your stars out these days, I will be making frequent trips and hopefully, will cross your path more often. Ten years is way to long to chat. So long story short, I had to replace it. I got another Honda as these babies are always problem free and they last so long. But with a new vehicle comes a car payment and I detest them so. Well enough about car woes, made a few finds over the weekend and brought them into the Queen of Hearts. We have our Open House beginning on Thursday this week and it goes through Sunday. Found this marvelous Victorian wicker plant stand several weeks ago and filled it with decorative boughs and poinsettias along with tiny white lights. It would be a lovely piece for a front entrance or foyer. Santa's list looks delightful next to this Victorian silverplated ink well and pen set. Very handsome Santa in rich velvets and faux furs. Pretty Art Nouveau crumb scraper and pan. Such an elegant little tool that is no longer used at the family table. Brought in three of the dolls that I purchased two weeks ago. Nice handpainted china babydoll, a 1930s composition Shirley Temple doll...get a load of those lovely curls, and then another composition and soft body doll with braids. Nifty antique print of girl walking in snow with a basket of kittens and a pair of vintage gold leafed stags. Is that Santa's corn cob pipe? Could be. Always love finding a vintage top hat to decorate for the holidays. This topper was badly beat up but a few stitches to keep it held together, a fancy holiday ribbon and picks with a few faux snowflakes and you have a decorative element right out of a Dicken's novel. Believe it or not, I found this marvelous graduated bead necklace of cherry Bakelite at my local Goodwill. Sterling clasp and hand knotted beads. A terrific find, nice art glass vase by Brian Maytum. Signed and dated, this tall beauty as marvelous iridescent oil spots throughout. Not old, but a neat table lamp, spun steel with lights around the wing and the fuselage. 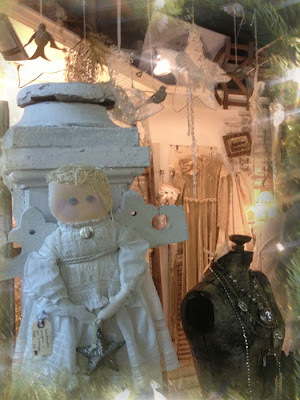 Mica dusted cherub will support a votive candle. Whimsical Santa piloting a blimp. Battery operated, the rear propeller spins. Item sold two hours after I displayed it. Another Goodwill find, this pair of metal sleights are perfect for holding favorite vintage Christmas balls, picks or poinsettias. 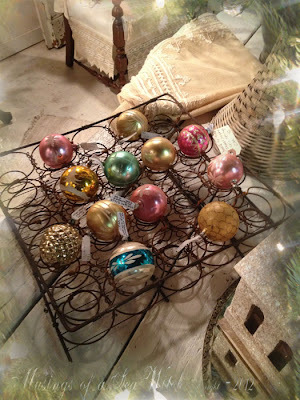 Brought in a few more holiday sprays and votive stands and a pair of gold plated pine cones from Dept 56. Can't forget the Thanksgiving holiday table. And finally, this beautiful salt glazed St. Nicholas in brilliant cobalt blues. If this piece doesn't sell, I won't mind, I like it too much and will keep it if it does not go. So much more to bring in with Open Houses all this week. Will be visiting one of my favorites on Wednesday, Vintage Village Candlelight Open House in Snellville. Will take lots of photos to share with you. If you are in the area, you must stop at Vintage Village for their Candlelight Open House. One of the best. If you have not already done so, get out and VOTE today. 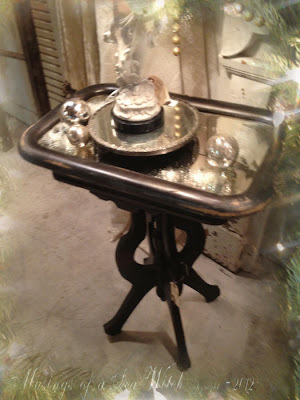 Less than 50 days until Christmas and my favorite antique shops are busy getting ready for their Holiday Walk events. 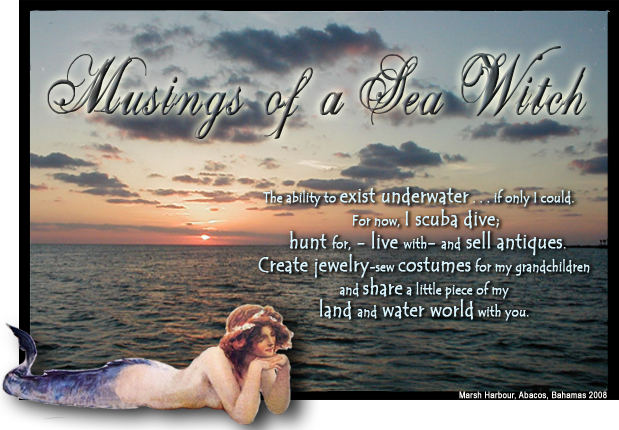 Which includes the SeaWitch. With two booths to decorate, my living room looks like antiques and holiday has thrown up all over it. Priced items like mad and loaded up the car for Buford-Queen of Hearts. 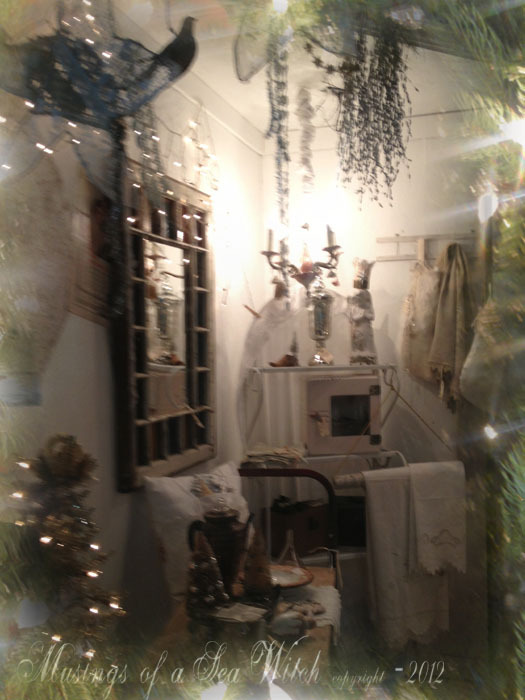 I like this time of year best in my Victorian booth. It lends itself to the holiday so well. Lots of vintage and antique silverplate, santas, and mercury glass, beaded ornaments to get this party started. Carved and faux carved vintage looking santas are a favorite selling item. Silverplate is everywhere and has always moved well for me. There is something special about the brilliant light that makes your best recipes look both inviting and elegant. Vintage gravy boats are ready for the Thanksgiving celebration. I love beaded latex fruit rings. They have so many decorative uses for the table. This was a Goodwill find in February of this year. Very tall and just delightful with a Dickens look to them. Perfect for a side table or mantle, they look marvelous nestled with pine boughs and tiny white lights. I displayed these on the antique oak mantle among the silverplate. From the time I left this booth to decorate the second booth, they were sold. Now I have to find another eye catcher for this booth as the Holiday Event at the Queen is in two weeks. Still, it's a problem that I don't mind having. Vintage beaded and sequined fruit are hung from the tree along with Victorian boot stockings. A wide shot of my Victorian booth. Still have lots to bring in and my living room is back to looking like a satellite warehouse for goods. I hate to rush through the holidays and especially like Thanksgiving for it's message. Giving and being thankful. I celebrate my table using my mother's Napco turkey salt and pepper shakers, my grandma's transfer ware turkey platter and my grandma-nana's Victorian cut glass water goblets. I bring in lots of transfer ware at this time of the year as well. Nifty advertising turkey platter from a furniture store and a selection of Homer Laughlin Historic America pieces in marvelous condition. Wedgwood Christmas plate for 1997. How sweet are these happy little sheet shepherds? Jake, Eli and Zeb. Vintage turkey cutouts are brilliant in color. These were from a teacher's estate an I bet these were pinned to her bulletin board each November. Adorable little Anne Habouche gnome figures from Holland. First time I have seen these and they are too sweet for words. 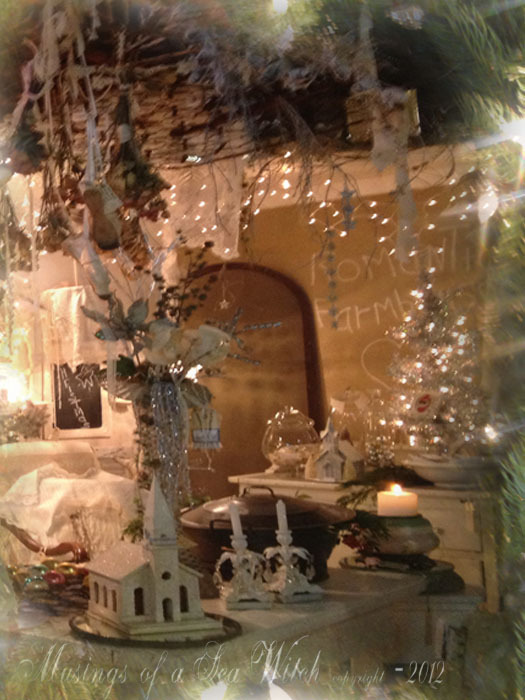 Pretty Christmas items for decorating the home.